As many will note in the format change for Restoration Radio this season, we have moved towards a course-based format that focuses on consecutive episodes of one show released over a single month, rather than an entire season. This also necessitated a change in how we recorded our work, as it made more sense to work through a group of episodes with our clergy in person, rather than the virtual recordings we were often doing by necessity. That's how I found myself in Nigeria some months back, working with Fr. Bede Nkamuke on the Sacred Scripture episodes that were released this season. I was privileged to work with Father even before he was a priest. 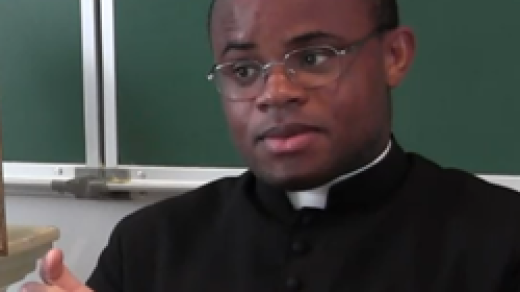 I posted an interview of him when he was a deacon as well as an interview with Fr. Larrabee, who had been kind enough to visit Nigeria while Father Nkamuke was still undergoing formation. I also was present at Fr. Nkamuke's priestly ordination in Florida (you can find photos of the ordination here and here, as well as his first Mass here). I never imagined, as I listened to Father Larrabee describe his trip to Nigeria, that I would actually get to visit Father myself and see the apostolate in action. 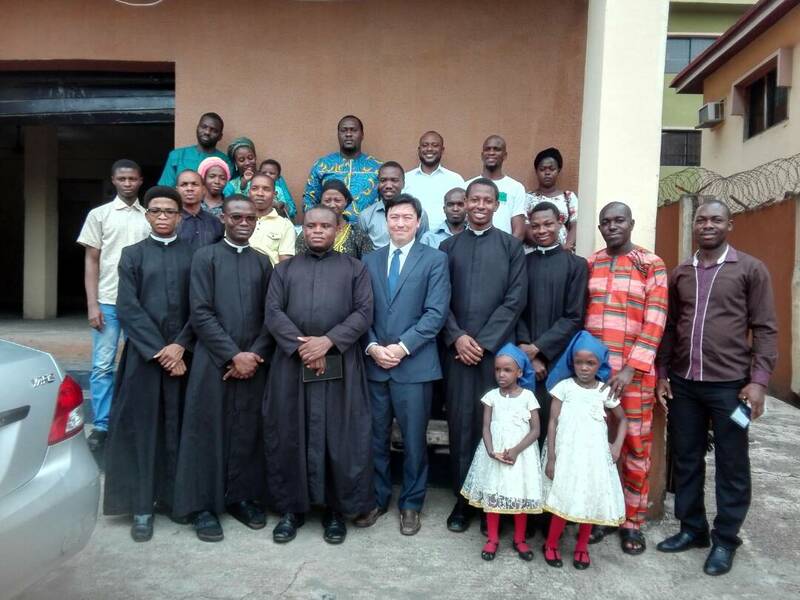 I've thankfully been able to add two new videos, one in which Father Nkamuke describes his mission circuit as of Spring 2018 as well as a short interview with the seminarians currently at Our Lady Seat of Wisdom House of Studies in Lagos, Nigeria. The group has grown exponentially since Father's visit, as you can see by this photo taken on the Sunday of my visit. 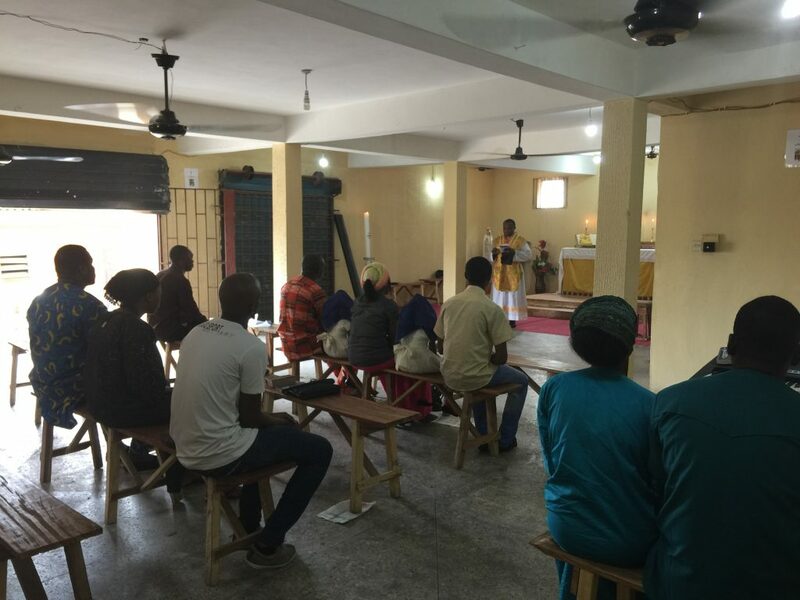 Even this photo doesn't fully represent the congregation, as at least 8-9 were away in bereavement for a death and funeral that had happened just a few days before in a different state for someone who was a core part of the apostolate in Nigeria. His loss will be felt for some time. What I was most touched by was the joy and seriousness of the congregation. They only had wooden benches and no kneelers (only newspapers, which we used more to keep our trousers from getting dusty than for padding), and the lights and fans were powered by a generator, as Nigeria's unreliable power grid (which goes on and off without notice) cannot be relied on. The same was true at the seminary, and while the seminarians seemed unbothered by the smell and noise of the generator, I immediately targeted one fix we could be part of: solar-powered lanterns that could be used in the seminary at night if the power went out. This would save gasoline costs for the generator and eliminate the terrific noise it caused. Several of the team here at TR personally donated towards these and as a company we donated the rest of the funds needed to buy a dozen solar lamps at a total cost of around $300 USD, including shipping, which have already arrived at the seminary and are being used by Father and the seminarians. Financially through the Bishop's Fund at St. Gertrude the Great. For years now the Bishop's Fund has provided funding to the Nigerian mission which has allowed it not just to operate, but to grow. The most immediate need is for batteries for an inverter which could be used for the chapel. As I stated above, electricity in Nigeria comes and goes, and generators are the loudest, cheapest way to deal with this problem. However, one that involves just a bit more cost and infinitely less noise is an inverter, which stores away power in batteries so that when there is an outage, the power can run off those large batteries until they are exhausted or the power comes back on. No smell, no noise, and much less cost. Someone has donated an inverter, but we need to buy batteries, at the cost of $375 each, and we need to buy two at least, four ideally. True Restoration is committed to purchasing at least one battery, and we are looking for donors for the others, or parts of the others. If this is something that interests you, after you make a donation using the link above, email us and let us know how much you donated and if you want it to go towards the battery. There's other things necessary as well, but this is our first pledge drive for this mission, so we want to keep our goals focused. Please note that the deadline for donations to be mailed is the end of July. By spiritual bouquet. The faithful in Nigeria would be heartened to know about the greater Catholic world, that we are thinking of them and praying for the success of their chapels. You can send any messages or notes, or mentions of Rosaries said or Masses offered to the address above. If you need to have Masses offered, you can also do so through SGG Resources. Thanks for taking the time to learn a bit more about the work of Fr. Nkamuke in Nigeria, and we hope that you will donate to this pledge drive at whatever level you can afford.